On Mar 15, 2018 I gave my first ever NCECA talk. I was part of a panel discussion called Glazes Without Borders, moderated by my teacher, Matt Katz. 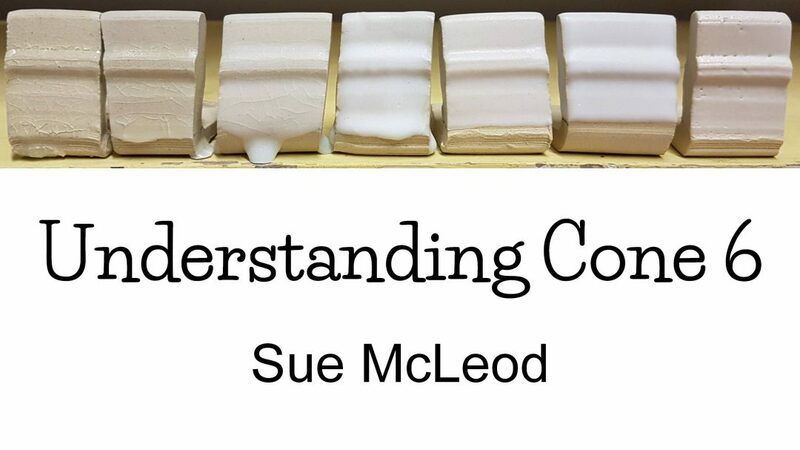 This video is a 20 minute clip of my presentation titled “Understanding Cone 6”. My co-presenters Kiara Matos and Peter Berg gave talks about “Copper as a Flux” and “Copper Leaching and Glaze Durability”. You can watch the full, hour long presentation on NCECA’s You Tube channel. Below, you will find the full text and slides from my talk for your reference. Click here to download a pdf of this presentation. Hi everyone, I’m Sue McLeod. I live in Victoria BC where I work full time as the ceramics studio technician at The Arts Centre at Cedar Hill. I also teach glaze workshops on the side and in my spare time, I make pots and test LOTS of glazes. 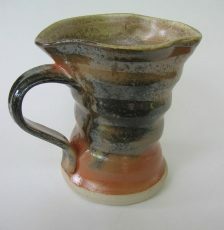 I first started working with clay in 2008 at Kootenay School of the Arts in Nelson, BC. At that time, they offered a 2 year diploma in clay. In first year, we didn’t make our own glazes, which sort of sucked but was sort of fine because I was still making pretty crappy pots anyways. But then in second year we had a glaze technology class where we learned a bit about glaze materials and we tested hundreds of recipes. That class totally changed my relationship with ceramics. In high school, chemistry was my favourite subject. I almost pursued it as a career, but I got distracted and dropped out of college to travel the world. I never really identified as an artist, I just always liked making things. Somehow though, I ended up in art school, which was a bit weird for me until I got to glaze class. The science made the art so much more exciting. I was really enthusiastic about learning how to mix my own glazes because the process just looked so scientific. 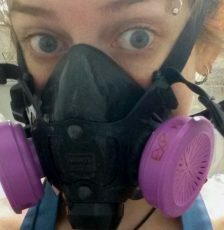 You wear a mask which made it look dangerous and important and you weigh out materials on a triple beam balance scale. It seemed so precise and mathematical which really attracted me. By the time I graduated, I had a binder full of glaze recipes and several boxes of test tiles. I had a good understanding of how to mix glazes and change their colours, but I still didn’t really understand how all the materials worked together. Next thing I knew, I was out on my own, and using my favourite glaze recipes from school. But they happened to be super runny at cone 6 so every firing was a gamble with fingers crossed that they didn’t run too much. I became very proficient with a bench grinder and a dremel. And then I ran into more problems like a kiln load where every pot with a certain glaze combo was cracked, right-in-two. I was losing so many pots, wasting so much time and not really learning anything. What were my options? Go back to school? Find new glazes? But I loved these glazes. And I had so many of them. I just need to learn how to adjust them. I know, I’ll ask the thousands of potters on Facebook what to do!! If any of you have ever asked a technical question in one of the ceramics Facebook groups, you might know what I’m talking about here. 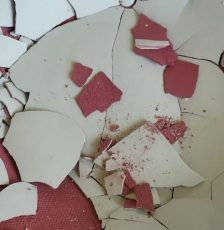 I posted a photo of my kiln load of cracked pots, and asked what I should do. I received exactly 65 comments, each telling me to do one thing or the other. Seriously??? Lower the lithium, add some silica, remove some silica, cristobalite, quartz inversion, change the heating rate, change the cooling rate, don’t open the kiln so soon, compress compress compress! I was grateful for everyone trying to help, but it got me nowhere. I didn’t know anyone, who should I listen to? I was more confused than ever. It was a very short time later that I saw a Facebook post for Matt Katz’s very first, online, Intro to Glazes course through Alfred University. It was a little pricey, especially when converted to Canadian dollars, but I did the math and quickly realized how much it was costing me to stay in the dark. I signed up and the course completely blew my mind. It answered all my questions plus a gazillion questions I hadn’t even thought of. That was in 2014. 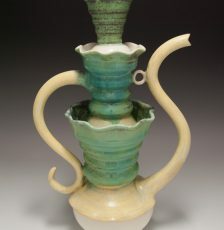 I have since taken Matt’s Glazes 2 class, his Clay Bodies class and I’m anxiously awaiting his next course offering. Fast forward to the present, thousands of test tiles later. 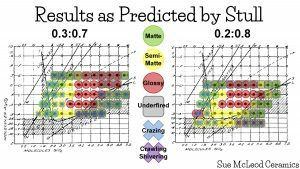 I’m going to present to you the research I did on cone 6 glazes, their relationship with Stull’s glaze map and how we can use Stull’s map to predict glaze behaviour at cone 6. Hopefully some of you are familiar with Stull’s map. If you’re not, I recommend taking one of Matt’s classes. 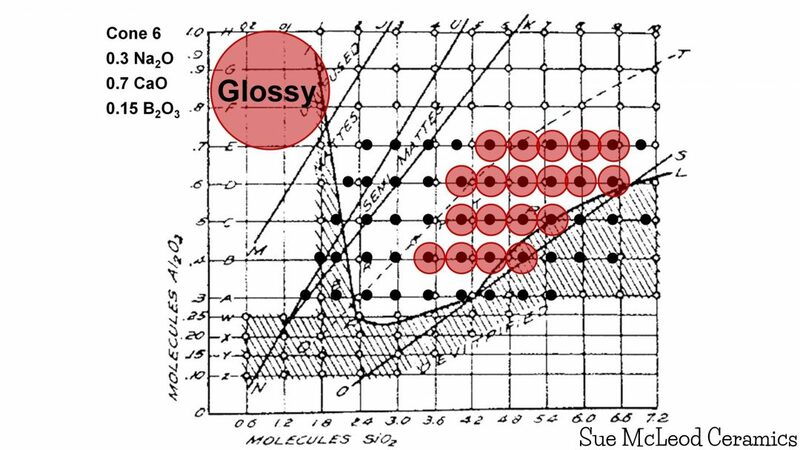 Stull’s map, (written in 1912, by the way) is a document that allows us to predict glaze behaviour, based on the chemistry of a glaze formula. In order to look at the chemistry of a glaze, we need to calculate the Unity Molecular Formula, or UMF, of the glaze recipe. The UMF takes all the glaze materials in a recipe and breaks them down into the number of molecules or moles, of each of the elements in our glaze. Every glaze will contain glass formers and every glaze will also contain fluxes. Fluxes are required to bring down the high melting temperatures of the glass formers. The glass formers are Silica, Alumina and Boron. Examples of fluxes are Sodium, Potassium, Magnesium, Calcium etc. If you were to look at a Periodic Table of Elements, the fluxes are found in the first 2 columns on the left. What the UMF does, is it puts the glass formers into proportion with the fluxes. Chemistry is all about proportions of one element to another. Once we know the UMF of our glaze recipe, we can plot it on Stull’s map and we will be able to predict how our glaze is going to behave, even before we put it in the kiln! You might be wondering how to calculate the UMF of your glaze recipes. There are various glaze calculation softwares out there where you just plug in your glaze recipe and it calculates the UMF for you. I recommend using the website Glazy.org. It’s free, and you can not only calculate the chemistry of your glazes, but you can upload photographs and share them with the ceramics community. It’s also a great resource if you’re looking for glaze recipes. Glazy.org will also take your glaze recipe and plot it onto Stull’s map for you. 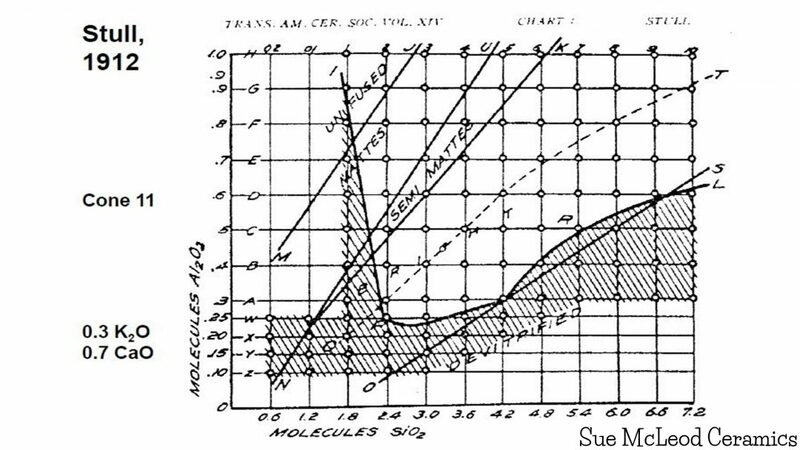 Stull’s map plots Silica levels on the X axis and Alumina levels on the Y axis, while keeping the flux ratio constant. Flux ratio? What’s a flux ratio? Well, there are 2 different kinds of fluxes. There are primary fluxes and secondary fluxes. The Primary Fluxes, also known as Alkali Metals or R2Os are found in the first column of the periodic table. They are Lithium, Sodium and Potassium. The Secondary Fluxes, also known as the Alkaline Earths or ROs are mainly found in the second column of the periodic table. They are Magnesium, Calcium, Strontium, Barium and Zinc. The 2 types of fluxes work together. The primary fluxes get the melting started and the secondary fluxes keep the melting under control. When looking at the UMF, the sum of the fluxes will always equal one. Then, we can further break down the fluxes and look at how much primary flux we have compared to how much secondary flux. This is called our flux ratio. It’s generally written as the ratio of R2O:RO. Historical and contemporary research have shown that a flux ratio of 0.3:0.7 contributes to the highest durability of a glaze. As you can see, this is the flux ratio that Stull used in his research. 0.3 moles of Sodium, to 0.7 moles of Calcium. With a consistent flux ratio, all he did was vary the amounts of Silica and Alumina to create glazes at all points on the map. So, what does Stull’s map tell us? Stull discovered that with a consistent flux ratio, a glaze’s surface quality- glossy, matte, crazed or underfired, is determined by the glaze’s silica and alumina levels and their proportion to each other. 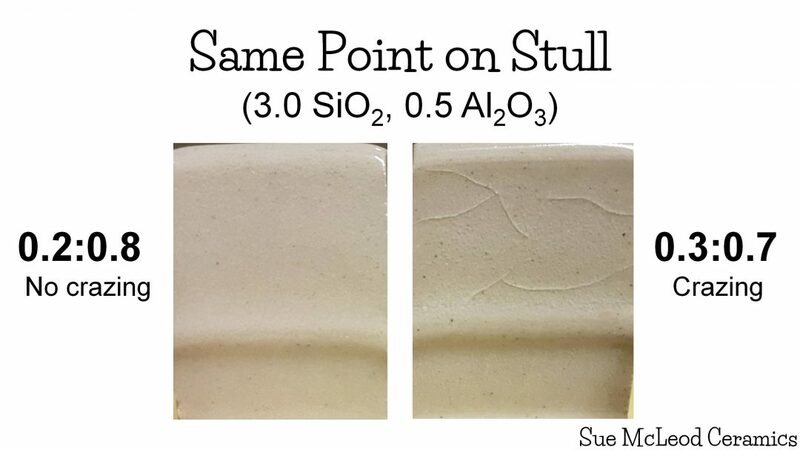 Stull predicts that glazes will be matte when the ratio of Silica to Alumina is 5:1 or below. As the silica:alumina ratio increases, the glaze become glossy. Stull refers to glossy as “Bright” on the map. 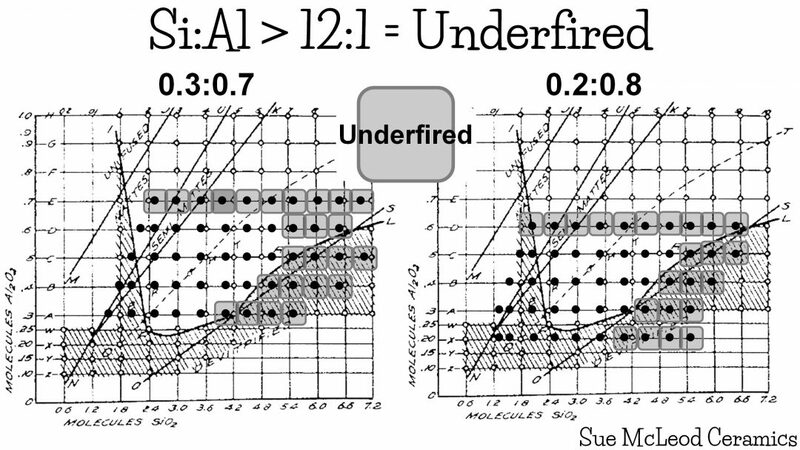 Stull predicts that glazes will be underfired at a Silica to Alumina ratio over 12:1. Stull refers to underfired as “De-vitrified”. Stull also predicts crazing, shown by hatch marks, at low silica and alumina levels, the lower left hand side of the map, as well as at high silica levels, the right hand side of the map. Stull’s research was done at cone 11. For my research project, I re-created Stull’s map at cone 6 to see if the same patterns would exist at a lower temperature. Since I was working at cone 6, I couldn’t rely on the fluxes alone to sufficiently melt my glazes. I needed to include some Boron, which is a low temperature glass former. 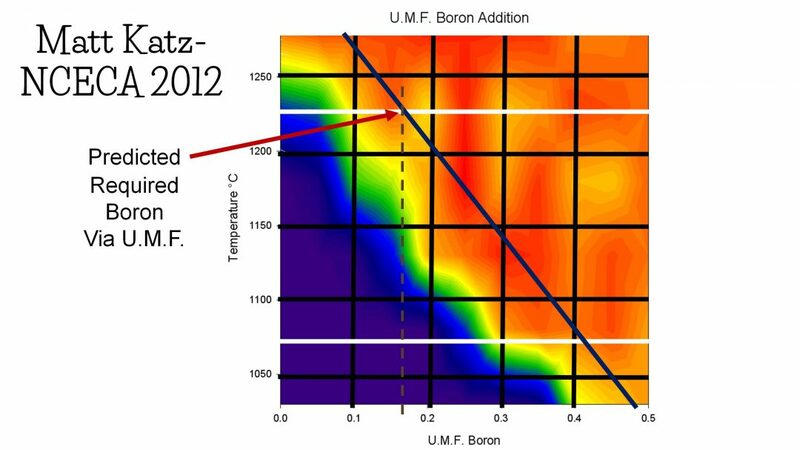 This chart, written by Matt Katz, shows the relationship between Boron levels and firing temperature. Based on this data, a consistent boron level of 0.15 was chosen for all tests. For the project, I created 2 separate Stull maps where I mixed a glaze sample for each point on the map and fired them all to cone 6. Here are the tiles, arranged as if they were on Stull’s map. Each row represents a constant Alumina level and the Silica increases from left to right. Map #1 on the left has a flux ratio of 0.3:0.7, same as Stull’s original map. Map #2 on the right has a flux ratio of 0.2:0.8. For both maps I used Sodium as the alkali metal flux or R2O, and Calcium as the alkaline earth flux, or RO. As I said before, all tiles have a boron level of 0.15. The clay body used for all tests was Plainsman M340. It’s a little hard to interpret my results, just by looking at photos of test tiles, so I coded all the data and plotted it on Stull’s original map. I looked at each individual tile and decided if it was matte, semi-matte, glossy, underfired, crazed, crawled or shivered. 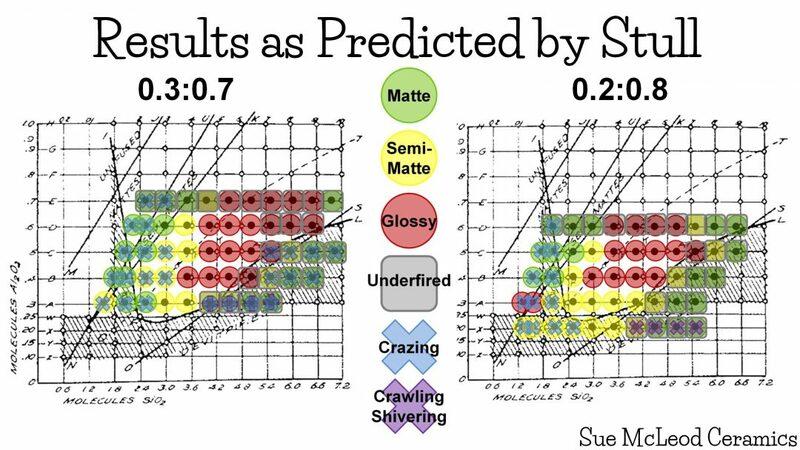 Here you can see the various trends that resulted at cone 6, and how they relate to Stull’s map. True matte glazes, represented by a green circle, are on the left side of the map. 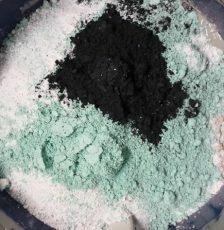 Then as silica increases and you move to the right, they become semi-matte, then glossy, and eventually underfired when the silica level becomes too high. To make the results more clear, here is Map #1, 0.3:0.7, showing only the glossy results. Notice how they follow the general pattern and shape of Stull’s original map. This is Map #1 again, showing only the matte glaze results. This left hand side of the map is where you will find true matte glazes. True matte glazes are fully melted, crystals growing in a glass. This is as opposed to underfired matte glazes, that are only matte because they haven’t melted yet. Often, these are underfired glossy glazes. If you have a matte glaze and you fire it hotter, and it becomes glossy, it was an underfired glaze to begin with. A true matte glaze, fired hotter, will run. A properly formed matte glaze will be matte at any temperature. From a functional standpoint, you want to avoid underfired glazes because they are unstable and will break down over time. A glaze only becomes durable once it melts into glass. 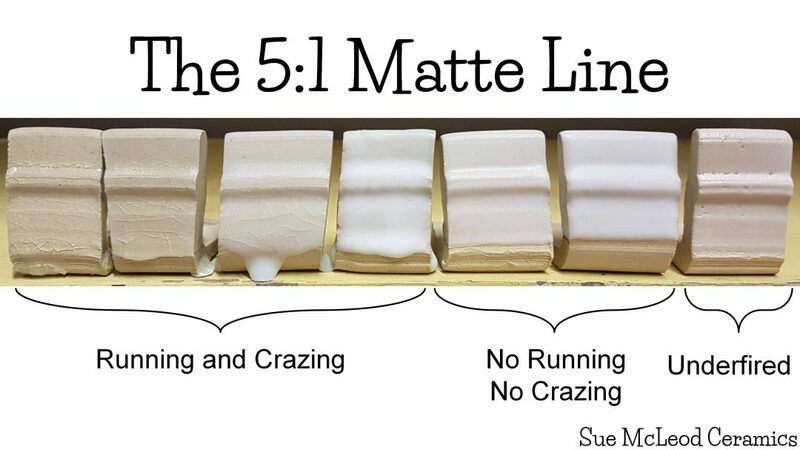 To make a true matte glaze, Stull found that you need a low silica:alumina ratio, generally 5:1 or lower. Look at the hard, diagonal line of green circles that moves straight up the line that Stull drew. This is the 5:1 matte line. My results line up exactly with the research that was done over 100 years ago. Science. Very, very cool. All glazes on this line have a silica:alumina ratio of 5:1. As soon as the Si:Al ratio went above 5:1, the glazes were no longer “matte” and started to become glossy. 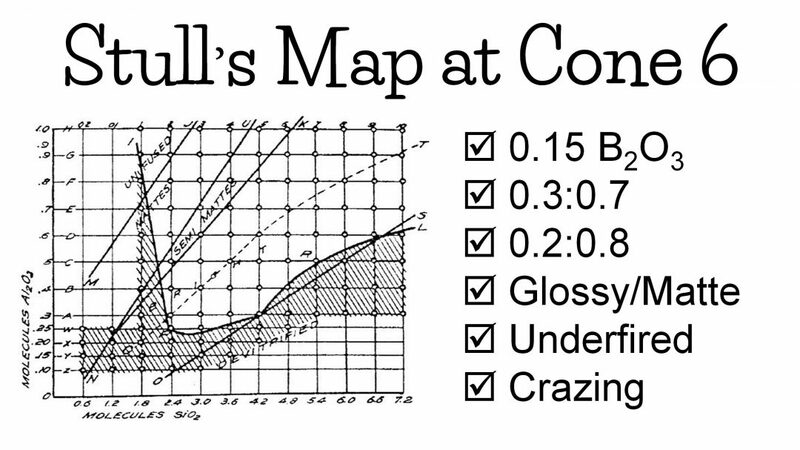 So, Stull’s map can be used to predict a matte or glossy surface, according to the Si:Al ratio. These tiles represent the 5:1 matte line that I showed you on the last slide. The tile on the far left contains 0.3 Alumina and 1.5 Silica. It would be plotted on the lower left hand corner of Stull’s map where it is predicted that there will be crazing. As you can see, there is crazing. This sample is also running because the silica and alumina levels are so low that it’s over-fired at cone 6. With each tile, moving from left to right, the alumina level increases by 0.05. The silica level is consistently 5 times the alumina. On Stull’s map, these tiles would move straight up that diagonal line of green circles from the last slide. As we move up the diagonal 5:1 line, increasing the silica and alumina proportionately, a couple things happen. The crazing is reduced until there is no crazing and the running is reduced until there is no running. If we keep moving up the line, eventually the glaze dries up as it has too much silica and alumina to melt at cone 6. 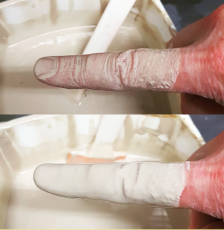 The results also show that there is a limit to how much silica and alumina a glaze can contain and still melt at a specific temperature, with a specific flux ratio and a set boron level. On both maps, when the silica:alumina ratio was above 12:1, the glazes were underfired. This behaviour was also predicted by stull, where he calls them “devitrified”. I also found there to be a max Alumina level, above which, the glazes were underfired. That level changed according to the flux ratio. On map #1, 0.3:0.7, the glazes dried up at 0.7 alumina. On map #2, the glazes dried up at a lower alumina level of 0.6. This is because at 0.2:0.8 flux ratio, the glazes have less R2O, which is the more powerful of the 2 fluxes. Notice how the pattern of underfired is almost identical on both maps. The shape is the same, it just shifts on the map, according to the conditions of what you’re testing. If I were to increase the firing temperature, the whole pattern would move upwards. There are some very interesting trends with regards to crazing and thermal expansion. Crazing results from the relationship between a specific glaze and a specific clay body. Stull’s map was created based on his results with his clay body. These are my results with my clay body. Keep in mind that your clay body may give different results as well, but the general patterns are the same. When your glaze has very low silica and alumina levels, you are likely to get crazing. As the silica and alumina levels increase, the crazing starts to disappear. If you have a crazed glaze and you only increase the Silica, you can move out of the crazing region, but you would then also be changing the Si:Al ratio. Doing so would change the surface quality of your glaze and if your glaze was matte, it could end up glossy. If your glaze was glossy, the transparency could change, or it could end up underfired. A better way would be to take your crazed glaze and increase the silica and alumina so that their ratio stays the same, and you will move out of the crazing region while maintaining the surface quality of the glaze. Now, let’s look at the far right hand side of the map, the high silica region. Map #2 has some, and Map #1 has quite a bit of crazing in this region. This is because unmelted silica has higher thermal expansion than melted silica. So these underfired tests are also crazed. And the last, most interesting thing to notice is that Map #2, 0.2:0.8 has a significantly lower number of crazed samples than Map #1. The reason being Sodium, the R2O flux has a higher thermal expansion than Calcium. Map #1 has a higher proportion of sodium than map #2, therefore, map #1 has more crazed samples. These 2 tiles are from the exact same point on the stull map. They have the same silica and alumina values, but different flux ratios. The sample from the 0.2:0.8 map has no crazing where there is crazing on the 0.3:0.7 sample. 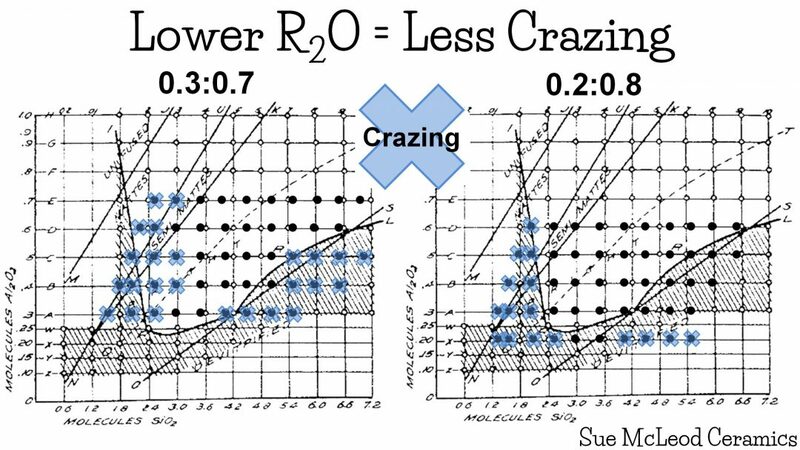 This tells us that another way to get rid of crazing is to adjust the flux ratio, lowering the R2O flux, while increasing the RO. 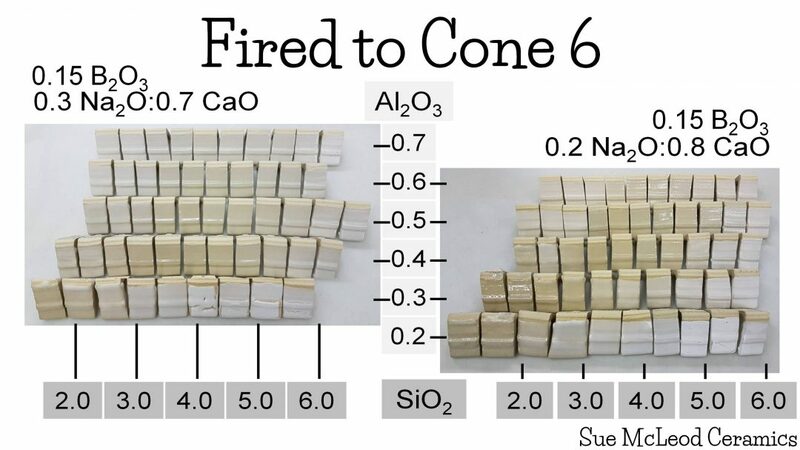 The results from this research show us that we can use Stull’s map to accurately predict glaze behaviour at cone 6. Stull tells us if our glaze will be glossy or matte, crazed or underfired. 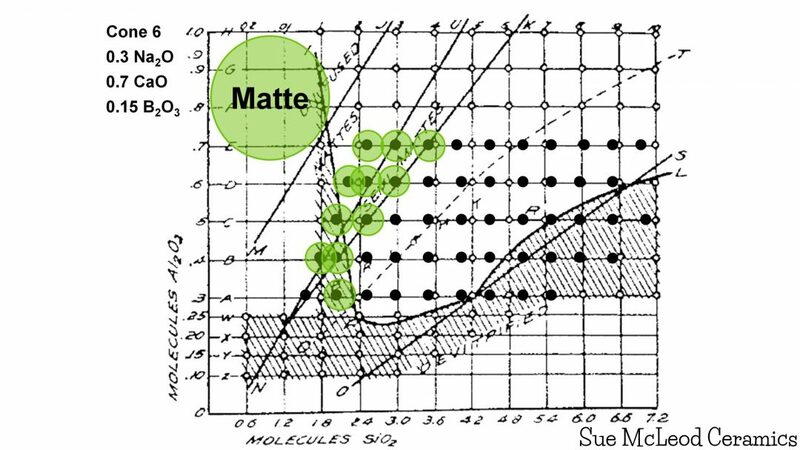 This leads me to believe that Stull’s map could accurately be used to predict glaze behaviour at any temperature, provided your glaze is properly composed to melt at that temperature. Please comment, ask questions and share. Nice work with the Stull exploration. Did you use line blends to generate all of the glazes for this experiment or did you mix each of the glazes individually? Thanks for reading and commenting. I started by mixing and sieving 300g of the glaze on the farthest left of each row, the lowest silica level I could attain for each alumina level. Recipe was calculated by UMF. Then I calculated how much silica I would need to add in grams to make 0.5 mol jumps, by UMF. Add silica, blend, dip tile, repeat to move along the x-axis. Start again for each alumina level. So, more accurate than a volumetric line blend and less work than mixing a whole new glaze for each point. A happy medium.